This years NEMI theme is all about the changing world we live in. 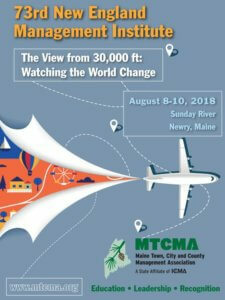 Next week OTELCO will be in the mountains of Newry Maine, attending the 73rd New England Management Institute. The Maine Town and City Manager’s executive committee hosts this event, and OTELCO has been a proud sponsor. This year’s theme is “The View from 30,000 feet: Watching the World Change”. The NEM Institute is full of educational presentations and fun activities, whether you are learning from one of the many institute presenters, or hitting a birdie on the scenic Sunday River Golf course. This year OTELCO is excited to be listed as one of the presenters, along with many other leading industry experts. Read on to discover what you can expect from this year’s New England Management Institute. Rooks’ Keynote address will take place on the first day of the conference, Wednesday 8/8/18, from 8:30am-10: 00 am. • How providers (private companies) determine the feasibility of capital expenditures for broadband infrastructure expansion. • Why municipalities are taking broadband deployment into their own hands. • Ways that municipalities and providers can collaborate through public-private partnerships to maximize efficiencies to deliver broadband. • A look at how some municipalities have accomplished broadband deployment in their communities. • Available resources for municipalities in Maine. Scheckel and Johnson will be presenting on Wednesday from 3:10pm-4: 00 pm. • Community Showcase: Join in on the 7th Annual Community Showcase. Bring a product from a local business in your community to raffle during the conference. • Food Drive for Charity: Bring along some non-perishable food for charity and you will receive one extra ticket for the grand prize. Attendees will submit names to local food pantries and the winning charity will be drawn at random. Just turn in your donation to the conference registration desk. Grand prize will be drawn on Friday. Must be present to win the grand prize. Must be willing to deliver donated items if your preferred charity is chosen. • Paint & Sip for All Ages: All-Conference Guests are welcome to attend a “paint & sip” activity on Wednesday afternoon while managers are in session. Instruction, materials, and refreshments will be provided. See the activity registration page to sign up. • Pre-Banquet Reception: Join friends and colleagues for drinks and hors-d’oeuvres on the Sliders deck (weather permitting) before the Awards Banquet on Wednesday evening. • Awards Banquet: The presentation of the Linc Stackpole Manager of the Year Award will take place on Wednesday evening, immediately following the reception. For a full schedule of presentations, events and additional institute information you can visit the Maine Municipal Association website or click here for the official NEMI guide. If you are at the event, please stop by the OTELCO booth for a complimentary goodie bag full of Municipal Broadband Information.